- France info (radio): chronique "Du côté des étoiles" (de Serge Brunier). - Astronomie Magazine N° 129 (magazine): review in the topic "Lire, voir, sortir...". - Le Télégramme (newspaper): portrait and presentation of the book. 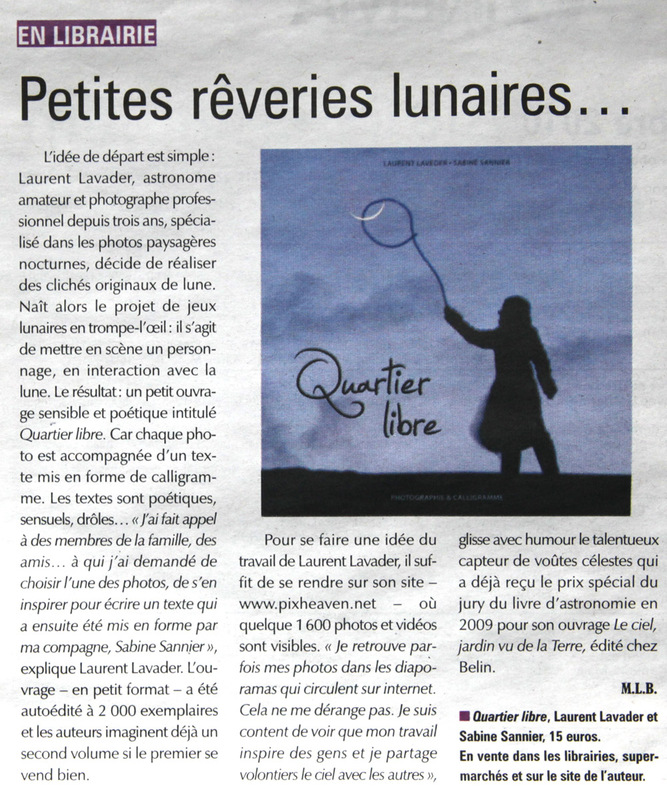 - Ouest-France (newspaper): interview and presentation of the book. - Le progrès de Cornouaille (newspaper): presentation of the book. The text writen by Jean-Marc Lévy-Leblond (p. 46) is refering to the "Rabbit on the Moon" which is pounding the ingredients for rice cake. Fro editing reasons, we didn't wanted to add the rabbit drawing in the photo. So for those of you who aren't abble to notice it, here is where it hides! The Biggest small book about the Moon! Summary: We have asked 19 authors to choose a picture each among a selection of photos. Then they had to write a short text in the style they wanted. Finally, Sabine (my grilfriend with who I conceive these Moon games, and the woman in the pictures), who is a graphic artist, has transformed the texts to calligrams. The different profiles of each author have leaded to a great variety for each picture, sometime funny, touching, poetic, sensual, etc.